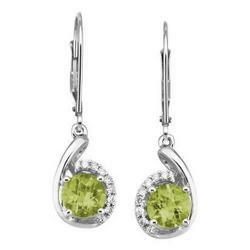 Also known as the Evening Emerald, the birthstone for August is the Peridot. When this stone is placed under artificial light it will glow the color of brilliant green. Although this gemstone is very much the same as the emerald it has a much softer intensity. Peridots that weigh as little as three or even two carats can be quite pricy and stones that are about eight carats are almost impossible to locate. Beyond this weight, the larger peridots are all pieces in museums or with Private Collectors. The Washington DC Smithsonian Institution holds a peridot stone on display of 310 carats. If you would like to view some of the most amazing peridot displays that contain some of the biggest and best specimens, they are currently held in the Chicago Field Museum and the New York City, Natural History American Museum. There are also several stories and strange legends that speak of the strong magical powers that are contained within the peridot. One of the legends states that once the Peridot gemstone is placed in a gold setting, it will enhance the ability for developing the potential this stone has as a talisman. This power is supposed to dispel bad dreams, fears and what is known as night terrors. However, Pliny, who was known as a Great Roman Authority, stated that an individual must wear the Peridot on his or her right arm if the strongest magic is to work for them. Different legends say that cups made from peridots were commonly used in healing rituals. It was believed that medicinal liquids worked much more effectively on individuals who were ill, when they drank from these. It was also believed that a totem engraving or a vulture would allow the Peridot gemstone to control the winds or have power over demonic spirits. The large peridots that were once contained in, Religious Treasures located in European cathedrals have been pillaged by wars. They disappeared and probably still exist today as many stones that have been cut and resized to smaller stones which have been set in different pieces of jewelry. Europeans brought Peridot gemstones back after the Crusades for use as decorations in church robes and plates, during the middle ages period. The Peridot was also well known to the ancient Hebrew people and it is listed in the Bible texts as a stone that Aaron used and it is mentioned in the book of Revelations, while speaking of the apocalypse.